Professor Dr Bo W Laursen. As inventor of the triangulenium dyes, Bo W Laursen is an expert in this particular type of dyes as well organic synthesis in general. He has been working with dyes and organic synthesis for more than a decade. This expertise make Bo W Laursen a very hands-on CEO that often can be found in the lab making new advanced dyes. Bo W Laursen is also an expert within the areas of fluorescence technology, optical materials, and molecular electronics. KU dyes offer his expertise in the form of custom synthesis, custom research, and consulting. 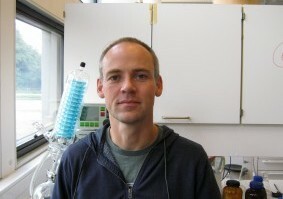 Co-founder of KU dyes, Thomas Just Sørensen, is a tinctorial chemist, an expert in dye chemistry and fluorescent technology. 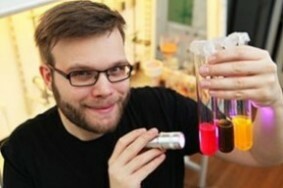 Since the early part of his career where he was making triangulenium dyes, Thomas Just Sørensen has focused on the application of organic fluorescent dyes and the synthesis of lanthanide based dyes. This has give Thomas Just Sørensen a large expertise within areas such as fluorescence microscopy, fluorescence based assay, and probe development. KU dyes offer his expertise in the form of custom synthesis, custom research, and consulting. Marco Santella provides the chemical muscles in KU dyes. He is in charge of making the many dyes in the KU dyes catalogue, and ensure that each batch of dyes meet the highest standards of characterisation and purity. The KU dyes mantra is that the highest quality probes ensures that all experiments using a KU dye are reproducible, today, tomorrow and next year. Marco Santella is in charge of the internal quality assurance and quality control procedures. Marco Santella has a strong expertise within preparative organic chemistry and the systematic approach to life required to excel in the QA/QC function.